Songs can elicit a range of emotions, and deliver a meaningful message in their lyrics. In whistled languages, the sound may be pretty, but the message is all business. Instead of speaking words phonetically, they are, of course, whistled. Their repertoire is often based on a traditional language from that same region. In a whistled language, the message is interpreted as words, which are comprised of many syllable-like sounds. Whistled languages aren’t actually syllabic, but have intonations that are based on an underlying spoken language – which itself is often tonal. The utility of whistling for communication lies in the varying frequency of each “syllable” along the wave of sound, which determines pitch. Tonal languages can most easily be translated into a whistled language because they already carry these variations and thus come with a pre-made set of “syllables.” In non-tonal languages, the language preserves the articulation of the spoken language within invented pitches. Psycholinguistics research has determined that the brain processes these languages in the same way as a spoken language. An estimated several hundred whistled languages are currently used somewhere in the world, often in remote locations. Southern and Eastern Africa, Aas in France, Oaxaca in Mexico, and New Guinea are among them. La Gomera in the Canary Islands hosts a Spanish-based whistled language called Silbo (Spanish for “whistle”). 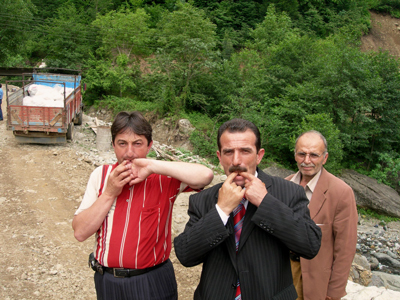 The small Turkish town of Kuşköy (“bird village” in Turkish), located in the Pontic Mountain along the Black Sea coast, speaks a whistled language called “kuş dili” (literally, “bird language.”) Its 500 residents use 20 different “syllables” mimicking the sounds of birds native to their region to form a pitch-based dialect of Turkish. Both of these languages have been used for hundreds of years. Why whistle a language instead of speaking? Whistled languages are most common in regions where the terrain is difficult to travel, like the rugged mountains. They allow the “musician” to communicate over longer distances by whistling loudly without having to walk or ride to the recipient. If one person could not reach their intended audience with their voice alone, they could create a chain of communication that goes from person to person until the message can be heard. Kuş dili, Silbo, and many other musical languages are on the world’s list of dying languages due to – what else? – the implementation of technology. Cell phones all but eliminate the need to relay information through whistling, and can deliver a message in much less time. Improvements in city infrastructure like roads and electricity have rendered the bird language a novelty for most people. But these languages are dear to their speakers and aren’t being silenced easily. The people of Kuşköy hold an annual festival to promote it among the village and its visitors. When Silbo was at risk for being phased out in the 1970s, the Gomeran government made learning it a standard part of the public education system. Among the sounds of whistling, the voices of the ancestors in these cultures are being heard. How and where can we learn kid dilli please?